So I'm slowly working through the events that I attended leading up to LFW, only a couple more to go before I can show you my adventures at fashion week! This event was Bloggers Festival, run by the lovely Scarlett! The event was held at the Paramount in Tottenham Court Road which, when you enter, looks like a block of offices, but when you exit the lift you find yourself in a rather classy space! Brands were dotted round the room with the all important bar in the centre, and Scarlett gave us a warm welcome with strawberry flavoured champagne which went down very well! There were a great selection of brands there, from fashion to beauty, big to small, well known to new start-ups. We were really spoilt for choice! Very were there showing off their end of summer collection and their new autumn/winter collection that will be released in the next month or so. I kept gravitating back to their rail as I completely fell in love with their new collection! I particularly loved the white beaded kimono above- the perfect cover up for party season! You really couldn't miss the Lee Stafford stall with their signature pink packaging! I was kindly given one of the round radial brushes to try out that I can't wait to try out! Oriflame had a stall and a display of their products as well as professional makeup artist giving makeovers for us lucky lot! I really look forward to getting to know this brand a bit more as, lets just say, I liked what I saw, especially the makeup brushes! Although it was slightly overcast outside the London skyline once again was a beautiful backdrop for the event! Quiz were also there with some gorgeous dresses...one of which you may recognise! I featured the black sequin one in a wishlist in August! I took the opportunity to have a look at it IRL, get some close-up shots and soak up all its beauty while it hung on the wall in front of me (wow I get way too passionate about clothes!!)! But look how pretty it is!!!!! Bee Good was a brand I hadn't heard of before but really like the sound of! It is run by experienced beekeepers and they use honey and beeswax to make their products. It was fascinating to learn how they also use the bark and resin collected by honeybees from tree sap and botanicals, as they are rich in vitamins and are really beneficial for your skin! They are also helping the protection of bees by donating a percentage of their profits to organisations such as the British Beekeeping Association. I adore bees and from a young age was encouraged to respect one if saw one a) so I wouldn't get stung and b) because some bees are in decline and my parents being the gardeners they are wanted to help protect them. It was so cool to see Urban Outfitters there too, and I've already started to make a wishlist of things I want (always dangerous)! I especially love the eye and holographic purses as they are such great statement pieces for a night out! Want her Dress had some gorgeous things on display too, including this lovely fur gilet that I completely fell in love with! It was so soft and a great layer for the coming cooler months. It also had a brown pleather belt so you could turn it into a sleeveless coat! Scarlett did a great job putting on an incredible and extremely well organised event! It was great see some old familiar faces and meeting some new ones- events like this are so great for meeting new people! I thoroughly look forward to the next Bloggers Festival! What do you think about the brands that were there? Discovered any new ones that you like? My taste in jewelry can vary from simple minimalist pieces to crazy loud statement pieces. I feel like they can really change the mood of an outfit, and top it off. I've been loving the simple bars and shapes that have been coming out recently, so when Alexi Accessories (who are local to me) contacted me to review one of their new products I was delighted, especially with the opportunity to support a local business! I decided to choose the Hollow Circle necklace in rose gold, as I loved the simple delicate shape with the little added luxe with the set jewels. It's from their Signature collection that is dedicated to delicate timeless pieces. The simplicity of it makes it almost Tumblr worthy and it goes with everything! From buttoned up and down shirts, jersey t-shirts and evening dresses, it's just as great layered up with other necklaces as it is on its own! I've also really been getting into rose gold jewelry and this 24 carat plaiting will really last- it's an investment piece so no more annoying scratches and scrapes if it goes through some wear and tear! And I've been wearing it a lot; when I've been rushing out the door and haven't had time to put on jewelry, I go straight to this as my fail safe! What's your go-to pieces of jewelry? It’s this time of year when us bloggers get super busy with events and shows during fashion season. One of those events was Bloggers Love Fashion Week, organised by the lovely Danielle! It was my first year at BLFW, but with 3 days packed full of catwalks and brands at the Penthouse in Leicester Square, I couldn't wait! The first day was a pre-party, but unfortunately the weather wasn't really in the party mood; me and my friend Emma battled through the wind and rain to get there! We had just come from filming so weren’t looking 100% on form, but thankfully the dark skies covered that! The fave thing I enjoyed about this day was that I got to finally meet so many lovely bloggers that I speak to all the time on social media but have never met in real life! I always find that so strange to wrap my head around- you can get on with someone so well without actually having met them face to face! With a scrummy candy bar to help ourselves to, I was able to have a catch up with Chloe from Clo's Beauty Spot and Aura from Aura Borealis Writes and meet some new faces in the form of Tania from When Tania Talks! Me and the lovely Aura! Roll on day 2! In the 3 hours there was so much to do! Brands were all around the edges of the 7th floor, with the middle left free for the catwalk! As we mingled and chatted, the hilarious Sarah Giggle supplied us with an amazing playlist to keep the atmosphere alive! On this day I got to meet even more lovely people that I'd spoken to through email but had never actually met! These included Olivia from Olivia's Beauty Blog, who actually lives in my town (who knew there were so many bloggers in Chesham?! ), and Gemma from Optimus PM who I've had many a lovely email from! The stunning feather accessories from Soundchick Accessories! I want those shoes! ...and followed by Rocco Fashion! Thank you Olivia for being my photographer! The final day...sob! There was even more food and brands today, and the room was packed full! Today I was finally able to meet Lizzie from Lizzie's World who I've been speaking to for ages on Instagram but, again, have never met in real life! We were treated to a longer catwalk show this time, starting off with Vania Couture! I was so in love with this dress! The dip hem, netting underskirt, flower details on the hip...the perfect evening dress! I also fell for this dress...it has rugged princess all over! Then we had my faves at IKRUSH!! I just adore those shoes!!! Then it was Tinkilove with their amazing experimental designs! My outfit for day 2 was special for two different reasons. Firstly, because the previous day I had been gifted these stunning sparkly trousers by Didi's Boutique which I am so grateful for! As soon as I got home I immediately tried them on and decided to wear them for this day! I love how even though they are harem pants, they are still slim fitting and very flattering. They are sooo comfy too! To show off the high waist and cute details on the pockets, I decided to team it with my Hunters and Gatherers crop top. The second reason was because one of my all time favourite people Katie from Kalanchoe was wearing exactly the same trousers as me! 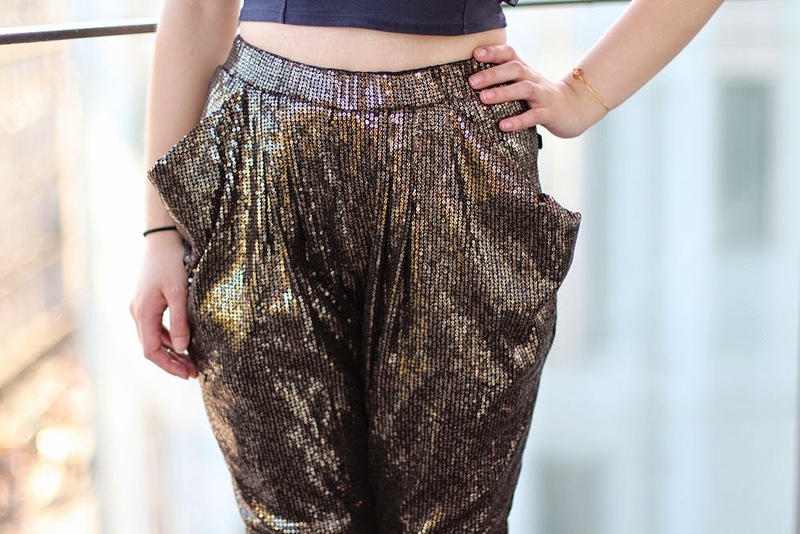 This was not a faux pas moment however- we had planned on Twitter the night before to wear them this day and become a sparkly trouser power team! We also decided to style it two different ways...what do you think of our outfits? I'd like to thank Danielle for running such an amazing event, all the brands I met and spoke to and who kindly gave me some awesome products to try, and to all the sweet bloggers I met and spoke to! What do you think about our sparkly trousers? How would you style them?